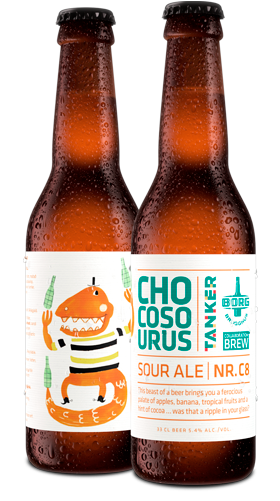 Chocosourus was brewed in collaboration with our talented friends at Tanker Brewery in Tallin, Estonia. A fresh and lively sour ale with a hint of chocolate, Chocosourus was brewed with cocoa husk from renowned Icelandic chocolate makers Omnom. The acidic nature of the ale is balanced with a smooth taste of fruit and cocoa. Illustration by Lóa Hjálmtýsdóttir of Lóaboratoríum.